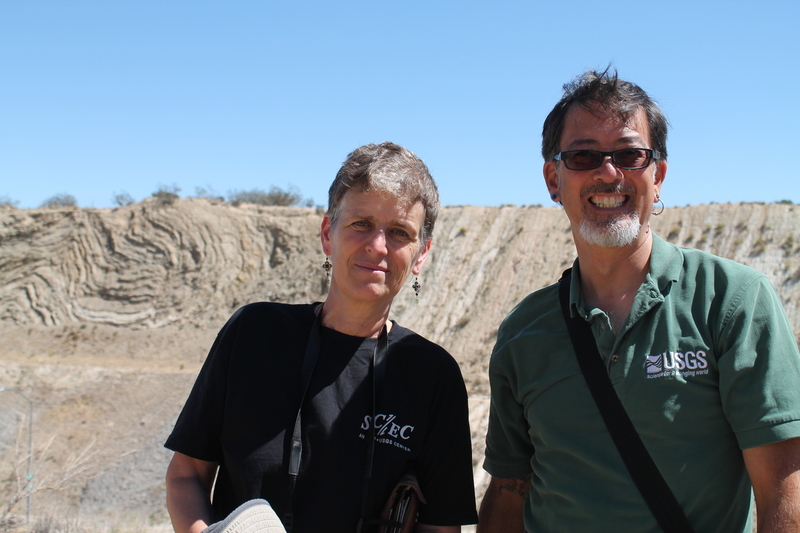 Last November, Sue Hough took a group of us from the USGS office on a field trip to see some earthquake-related sights around the San Andreas Fault. I thought this was all very interesting, and I also thought that this could make a good Obscura Society event. I first talked to Erin about it in February, when we did the bar crawl in Los Feliz. I talked to Sue and she agreed to come along to narrate the tour. And after we worked out all the scheduling details, Field Agent Sandi was ready to put it all together. She arranged for a bus and driver, and I worked out the route and sights. We added three additional sights that were not on Sue’s original tour. This time, we were going to stop at the Lamont Odett Vista Point on the 14 freeway in Palmdale. This overlooks the fault, and we could see the trace of it stretching off into the distance in both directions. The second extra stop was to climb the small hill so we could get a better look at the famous road cut on the 14. 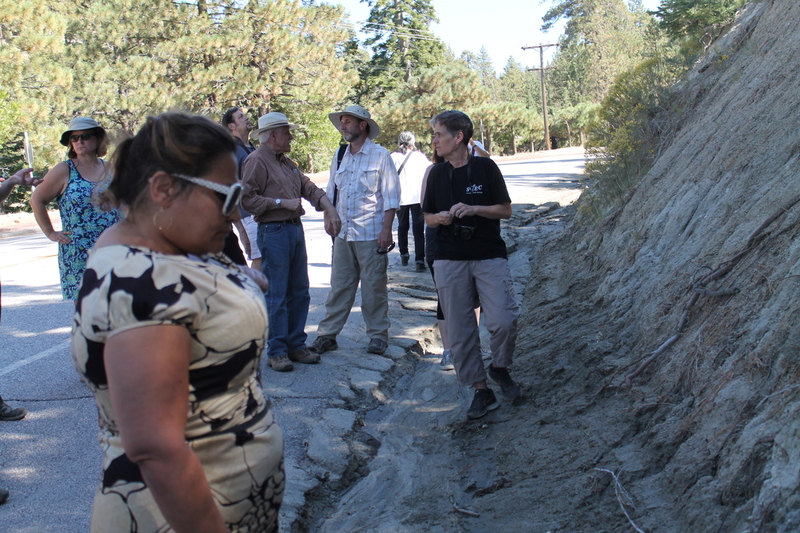 And finally, we stopped at the Pallet Creek site where Kerry Sieh did his original trenching studies back in the ’70s. With all that in place, we were ready for the first Atlas Obscura San Andreas Fault Scavenger Hunt. 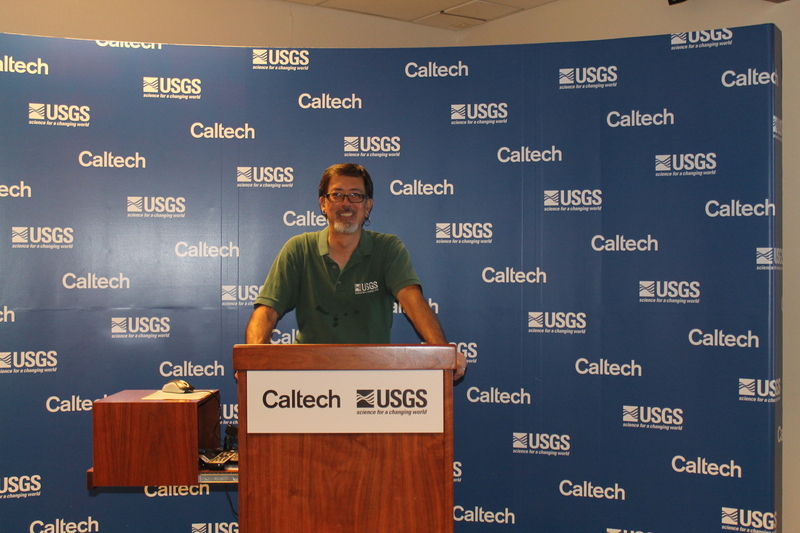 We started off at Caltech. This was partly because it’s fairly centrally-located and has available parking on weekends, and also so I could take the group on a short tour of the Seismo Lab before we left for the actual field trip. We started out at the downstairs exhibit, including a small piece of the Pallet Creek trench that is in display there. Then we headed upstairs to see the Media Center. I had some fact sheets and such to hand out, and I showed them a bit about the displays there. And on our way out, we stopped at the relief map on the wall in the hallway, and I showed them were we were going to go on the tour today. Then we headed down to the bus. The first part of the tour was the relatively short ride to San Fernando to see the fault scarp next to the McDonald’s. On the way there, Sue entertained everyone with stories she found when writing her biography of Charles Richter. When we got there, she described to us how the scarp had formed in the 1971 earthquake. 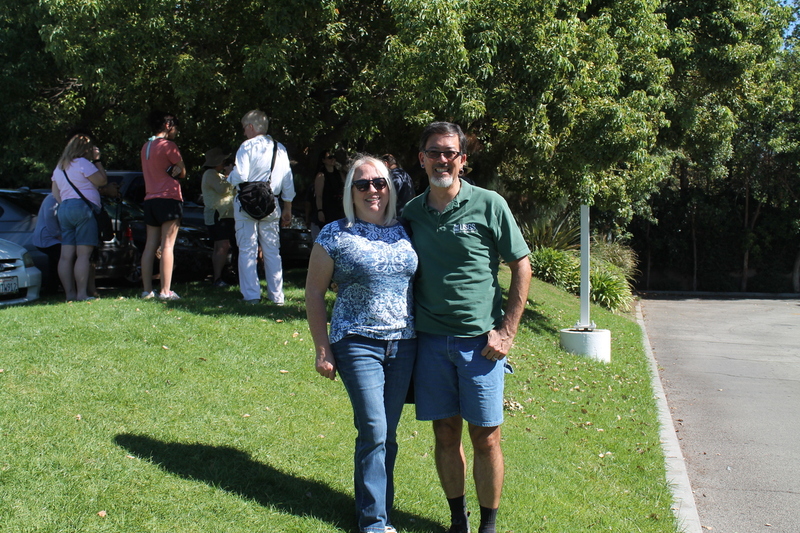 There was a guy on the tour who had spent some time back in 1971 traveling around and photographing the earthquake, and he had some good stories to tell. Then it was off to Palmdale. It’s kind of a long ride to get there, and we’d wanted to play a video about earthquakes on the bus, but the player didn’t work properly. It was having trouble reading the disc, and so the video was choppy. So we gave up on that, and Sue told us about more Richter-lore. 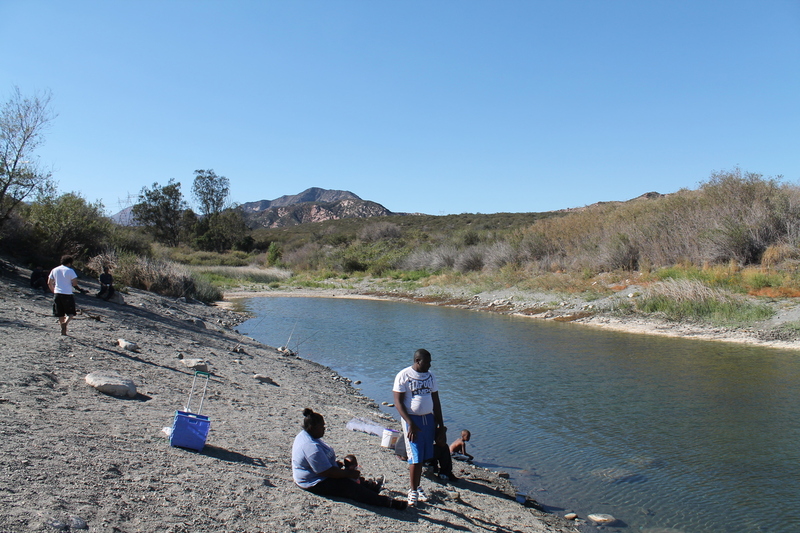 When we got to Palmdale, we turned off at the Lamont Odett Vista Point off the 14 freeway. This overlooks Lake Palmdale and the California Aqueduct. And also the San Andreas Fault. The lake started out as a sag pond on the fault, and from there, we could see the trace of the fault stretching out as far as we could see in both directions. Next up was the famous road cut where the 14 freeway crosses the fault. 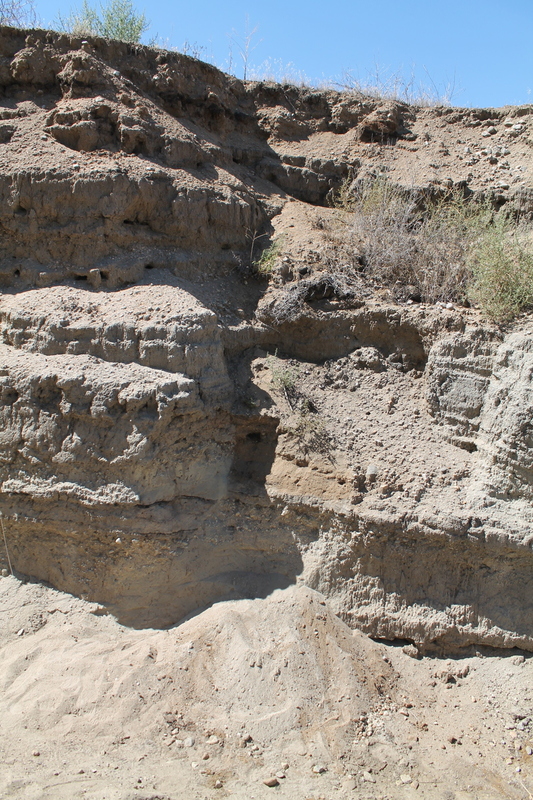 The movement of the fault has pushed up a little hill, and in the process, it tortured the layers of rock in the hill. Then the freeway came along and blasted a cut through the hill, so we parked the bus and walked up one side of the hill so we could look down into the cut and admire the twisted rock layers. By now, it was lunchtime. Our lunch stop was at Charlie Brown Farms in Littlerock. This is a very odd place. 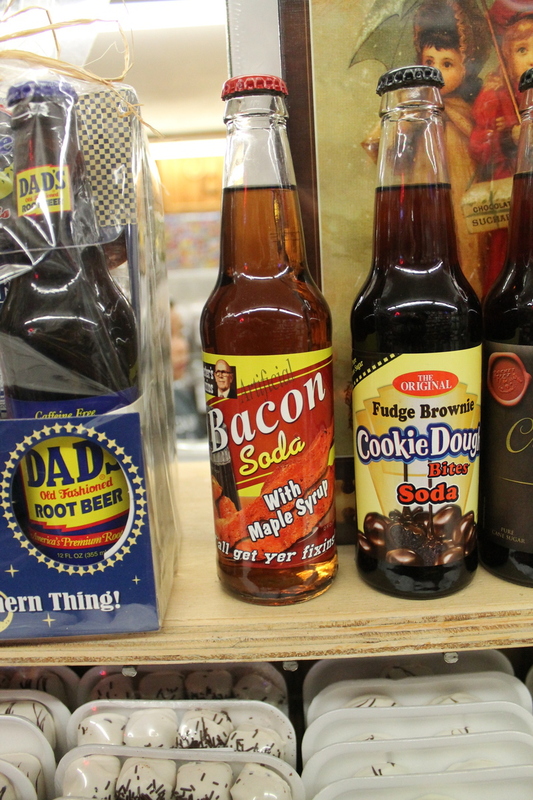 They have bacon-flavored soda. And kangaroo meat. And dinosaurs outside. It was very strange, but entertaining. So we spent some time there having lunch before heading off for the rest of the tour. The next stop was only a few miles down the road. There is a spot on Pallet Creek Road where someone has put up a pair of signs to mark where the fault crosses the road. From there, again, we could see the trace of the fault stretching off into the distance as far as we could see in both directions. 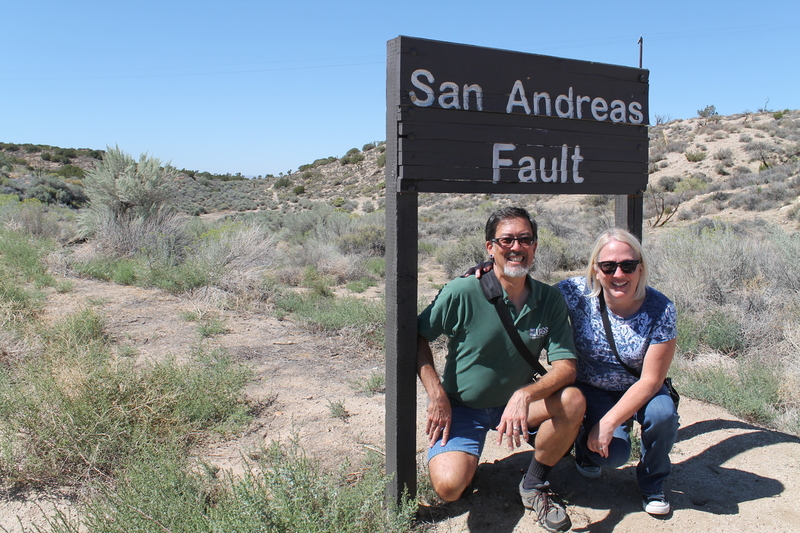 But mostly, it’s a photo-op to get our pictures with the sign marking the fault. Just a short distance down the road was the actual Pallet Creek site where Kerry Sieh did his original trenching studies back in the ’70s. This was how he found evidence of large earthquakes prior to recorded history, and was able to estimate that they happen along that stretch of the fault about every 150 years, on average. Ken Hudnut from my office had recently brought a group up to see this site, and he’d prepared a poster to show them to explain what they were looking at, and he’d graciously given it to me to bring along today. So Sandi and I held the poster up, while Sue pointed out the features of the sediment layers, and in particular, the one spot in them where the layers were broken and offset. 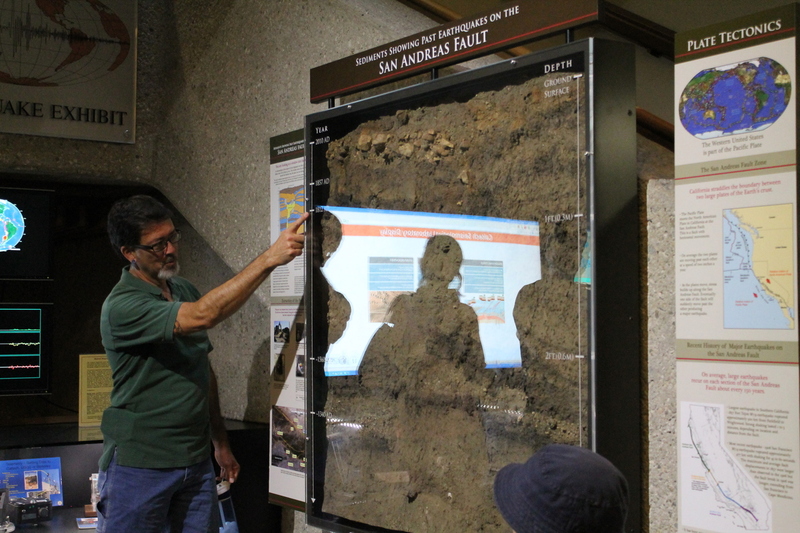 This marked the actual trace of the fault, and everyone had a chance to go and touch the spot and actually feel a little bit of the San Andreas Fault. The next stop was a ways down the fault, and up into the mountains. The bus was working hard, climbing up the mountain road to Big Pines. This was a bit of a problem, since when the bus was working especially hard, it would automatically cut off the air conditioner. Coming up from the hot desert, this was a bit of a problem. But we finally made it up the the road cut up in the mountains where the cut went right through the fault, and one side of the cut was entirely sandy fault gouge. Sue showed us how it is basically ground-up rock, but we could dig in it and pull out chunks of rock. But since the rocks had been shattered by earthquakes, we could crush them in our hands. Everyone seemed to enjoy that. 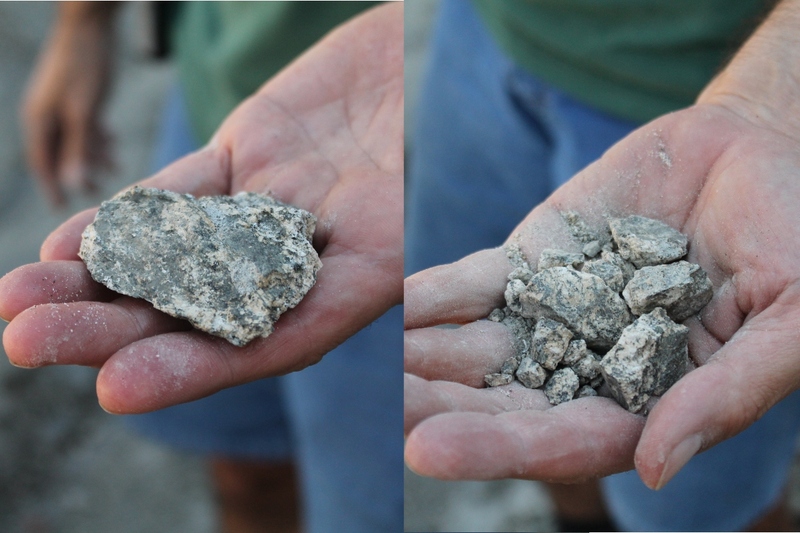 It’s not every day when you can take a chunk of granite and crush it in your hands. From there, we continued on up the mountains and through Wrightwood. We went down the road down Lone Pine Canyon. That is the road that follows the trace of the fault, and it’s the way we went last time we did this tour. But since I was more involved and navigating this time, I realized just how scary a descent that is. The road down the canyon is many, many miles of 10% downgrade, and it was kind of intimidating. But our driver was good, and he got us down to the bottom just fine. We got on the 15 freeway for one exit, and then we got off to go visit Lost Lake. Lost Lake is a little sag pond on the fault near Cajon Pass. It’s a very improbable thing. A little lake in the middle of the desert. No stream feeds it, and no stream drains it. The water is cold, and it just comes up out of the fault below. One thing I did notice, though. The water in the lake was quite a bit lower than it was last November when we visited. I guess it’s yet another casualty of the drought. That brought us to the end our our tour. We got back on the bus for the trip back to Pasadena. It seemed that everyone liked it, and Sandi was talking about wanting to do it again. I’m game for that, although I’m not sure Sue was. But I think that’s all right. There are other scientists in the office who might be willing to do this, or, if it comes down to it, I can do the narration myself. So I think we may well do this tour again.